Of all of the spacious and luxurious West Hill English Carriage Homes at Meadowood, the Dunbarton residence is the largest at 2,750 square feet with space to enjoy and make your own. Like all of our Carriage Homes, the Dunbarton is an ideal place for an active, independent lifestyle – surrounded by Meadowood’s thriving community and park-like campus. Ready to explore the Dunbarton residence? Let’s take a look! The Dunbarton residence at Meadowood offers two full bathrooms, two spacious bedrooms and a collection of living spaces to complement your dynamic lifestyle. From its welcoming foyer, to its versatile den, to its lovely living and dining rooms, the Dunbarton offers an intelligently designed space for entertaining and relaxing. Furthermore, the layout of the Dunbarton situates the kitchen and living areas away from the bedrooms and bathrooms, creating a thoughtful separation of shared space and private, quiet space. As you pass through the Dunbarton’s covered entryway and enter the residence’s bright foyer, you’ll quickly notice that the Dunbarton home has stairs leading to a loft, which can be used as an extra bedroom or storage space. Then, immediately noticeable upon entering the large living area is another uncommon touch – the gas fireplace. It’s flanked by two large windows that bring bountiful natural light into the center of the home. Inside the contemporary kitchen, the large island offers a great spot for entertaining, and it can serve as a bar area or a place for serving a buffet-style meal. The optional bay window provides a great spot for a breakfast nook and presents another place for natural light to illuminate the space. On the other side of the Dunbarton residence at Meadowood, the master bedroom feels like a luxury suite. The angular shape of the master bedroom gives it a unique feel, while its dual walk-in closets provide a generous amount of storage. Connected to the master bedroom is the master bathroom, with modern finishes, a glass-enclosed shower, dual vanities and the home’s laundry room conveniently adjacent. If it’s a nice day and you’d rather get a taste of the outdoors, you can also dine or relax in the Dunbarton’s large patio. And when it’s time to leave home and perhaps visit one of the numerous area attractions, just head to the spacious two-car garage and be on your way. 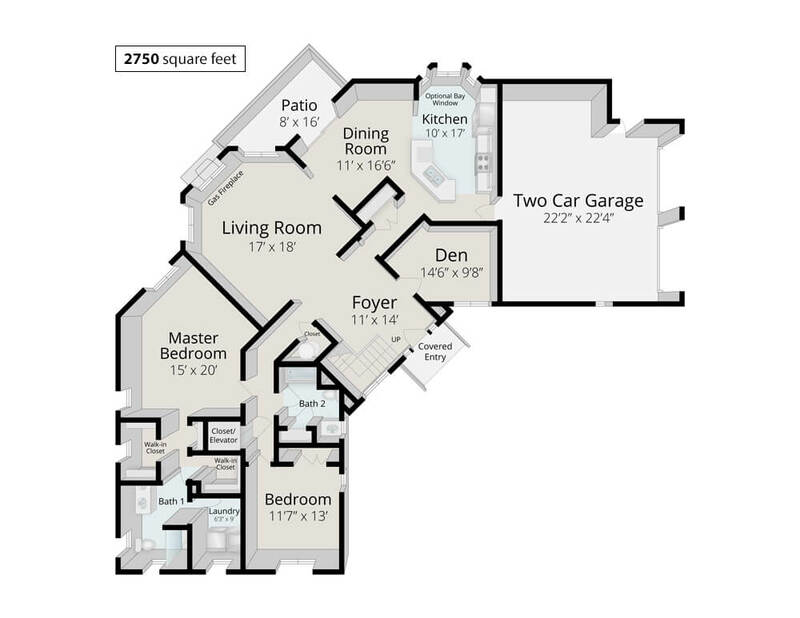 When considering a home this size, you may ask, “Won’t a home this large require a lot of upkeep?” The good news about the Dunbarton residence at Meadowood is that we take care of all of the housework! As part of your monthly service package, yard work, home maintenance, home repairs and light housekeeping are all included – so you can spend your time in the Dunbarton exactly how you choose. Additionally, while you’ll love spending time in the Dunbarton, you’ll always have ample opportunities to get out and enjoy all the activities that Meadowood has to offer. Fitness classes. Movie nights. Restaurant excursions. They’re all part of life here! The best way to see what we mean is to stop by for a personalized visit. To get in touch, simply click here or call 610-584-1000 today!